GH3C-283 | Size: 15 ml / 0.51 fl. oz. 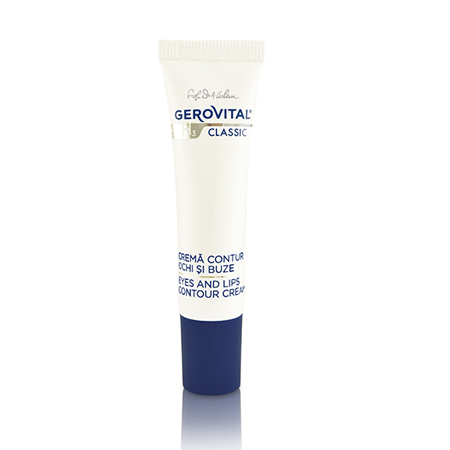 Gerovital H3 Prof. Dr. Ana Aslan line reinvents itself with better looks and stronger anti-wrinkle capabilities. Effectively prevents and treats wrinkles and fine lines around the eyes and lips. Juvinity™ - delays metabolic aging and invigorates cell replication. Gerovital H3 Prof. Dr. Ana Aslan is the first anti-aging brand in the world. Juvinity™ is an ingredient designed to fight against signs of ageing due to cells’ biological aging. Based on a complex lipid derived from a key molecule in cell functionality, Juvinity™ smoothes wrinkles, restructures and adds density to the skin. Ingredients: Aqua (Water), Glycine, Soja Oil, Glycerin, Cetearyl Alcohol, Ceteareth-20, Squalane, Glyceryl Stereate, Xylitylglucoside, Anhydroxylitol, Xylitol, Dipalmitoyl Hydroxyproline, Tocopheryl Acetate, Caprylic Capric Triglyceride, Geranylgeranylisopropanol, Sodium Polyacrylate, Hydrogenated Polydecene, Trideceth-6, Phenoxyethanol, Methylparaben, Ethylparaben, Propylparaben, Butylparaben, Parfum, Butyrospermum, Parkii Butter, Sodium Hyaluronate, Tetrasodium EDTA, Sodium Hydroxide, BHA. i use this on a daily basis and have seen what i call miraculous changes in the wrinkles that a woman of my age is prone to. I do not mind looking in the mirror any more...thank you Markastore!